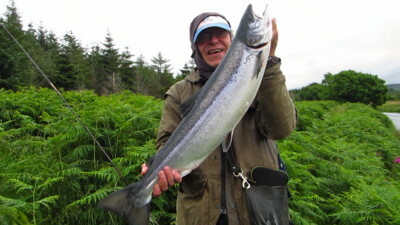 Ireland has some of the finest angling in Europe on offer. Game, coarse and sea-fishing can be very good. But great angling doesn't jump at the angler anymore. He has to search for it amongst the many hundreds of potential waters. To simplify this quest, and to portray the joys of angling is the aim of this website. You will find here useful flies, many different waters and of course many pictures and video clips of landscapes, anglers and fish. We offer award winning angling movies on DVD. You can order directly from the "TheMovies " page. See more pictures in full-size in our Gallery. Here are marked all the Irish waters we have fished in over 30 years. Some of them only once or twice, others very regularly; and few a hundred times or more. Pictures, video clips or texts regarding most of the fisheries marked on this map can be found by using the SEARCH facility of this website. Most of the markers are directly linked to a relevant clip.